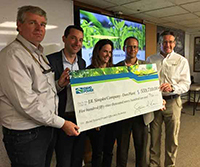 BOISE, Idaho – The J.R. Simplot Company recently received an incentive from Idaho Power for energy-saving upgrades at its fertilizer plant in Pocatello, Idaho. Simplot implemented several new systems to reduce the energy used while cooling products at the plant. These “Blend System Upgrades” are estimated to save more than three million kilowatt hours of electricity per year — enough to power about 260 average homes. (L to R) Klaas Hutter, Vice President of Mining and Manufacturing, Simplot Agribusiness; Adam Richins, Vice President of Customer Operations and Business Development Vice President, Idaho Power; Trisha Arave, Don Plant Manager, Simplot Agribusiness; Bo Hanchey, Regional Manager, Idaho Power; Garrett Lofto, President, Simplot Agribusiness. The incentive is part of Idaho Power’s Commercial and Industrial Energy Efficiency program. Last year, Simplot received the Idaho Power Excellence in Energy Efficiency award for its ongoing commitment to operational excellence through the efficient use of energy, incentives earned through energy efficiency programs and for achieving energy savings few companies have achieved in our service area.